Maine State Police arrested Corey Berry, 31, of Hollis, after he allegedly wandered through Hollis wearing a clown mask and wielding a machete. 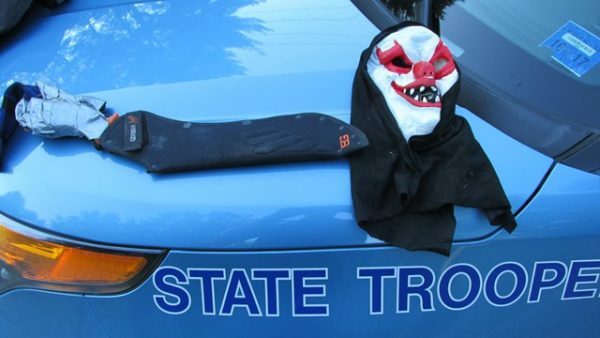 State police arrested a Hollis man after residents allegedly spotted him wandering around town wearing a clown mask and carrying a machete, according to WCSH6. Residents started calling police around 6 p.m. Tuesday to report the sightings around Little Mart on Plains Road. The man went into the woods before troopers arrived. Around 7 p.m. troopers looking for the man spotted him coming out of the woods on Townhouse Road in Waterboro. The troopers arrested 31-year-old Corey Berry of Hollis and charged him with criminal threatening. He was taken to York County Jail, where he later posted $200 bail. The machete was secured to Berry’s arm, which had been partially amputated, with duct tape. Berry reportedly was intoxicated and told officers he wanted to mimic previous “creepy clown” pranks reported across the country in recent years, according to the news station.